Mount your ride, Grab your bow, and Aim for the Top of the Arena! Listen up, Rookie! Welcome to the Battle of Arrows, the horseback archery arena where skill (and some grit) is everything. Let me tell you the basics of the duel: Drag the quiver with your fingertips, tilt your device to aim, and release to shoot! Sounds easy, eh? Well I bet you can’t do that so easily while riding a horse. Now hop on and start shooting – get ready to take on the world in global real-time duels! Test your skills in real-time duels against players from all around the globe! Experience the dynamic thrill of horseback archery duels! Friendly Match! Duel your friend full of fun at any time! From longbows to dual-wielding hand crossbows pick from 6 unique bow types! 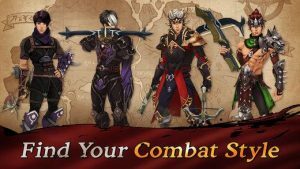 Create your unique combat style by choosing bow type, skill set, and equipment. Team up with your friends to defeat massively powerful raid bosses! I recently started playing this game, and from the moment I started I was hooked. It not only offers a fun engaging arena style pvp mode, but also a fun PvE campaign with great rewards. It’s a great game that you can pick up and play for 5-10 minutes and feel like you got the value for your time. It doesn’t force you to be on it for hours. It really is a mobile game you can play whenever you feel like it, without having to worry about checking on it every couple of hours. I can’t wait to see more games by 4:33 especially The Tale of Five Kingdoms.